Leveraging on the technological innovation, we have along-with a whole new range of Carton Taping Machines, which are widely used for strapping cartons of varied dimensions and customized heights. This gives a wide option to customers in choosing their preferred range of products. The Taping Carton Machine is engineered with high-grade raw material, following all the specification of international standards. This machine comprises adjustable belts, which makes it user-savvy and smooth in performance. In addition, our Carton Sealing Machine operates without any kind of noise and holds high productive value. 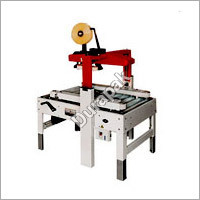 Quick processing and automatic adjustment without any support of tools, makes these aforesaid machines highly reliable. Owing to striking features of low power consumption, less noise, excellent operational control and high performance, the Carton Taping Machines always stays in huge demand in the market. Right from the procurement of raw material to final stage of production job, we make sure to carry all the task in a precise way to churn out quality machines that meets each requirement of customers.